Emergency medicine doctors say trauma victims must receive care within the “golden hour” to survive. But many rural Texas counties aren’t anywhere near hospitals that can handle complex injuries or illness. PRESIDIO — There’s a saying down in Presidio: If you’re going to have a heart attack, you better be first. With a single ambulance and a 100-mile ride to the nearest hospital, the prognosis is already grim. If you have an emergency while that ambulance is out on a run, you’re plum out of luck. Across much of rural Texas, emergency or trauma care is simply nonexistent, or limited to one ambulance and a part-time EMS crew. Emergency medicine doctors say trauma victims must receive care within the “golden hour” in order to survive. 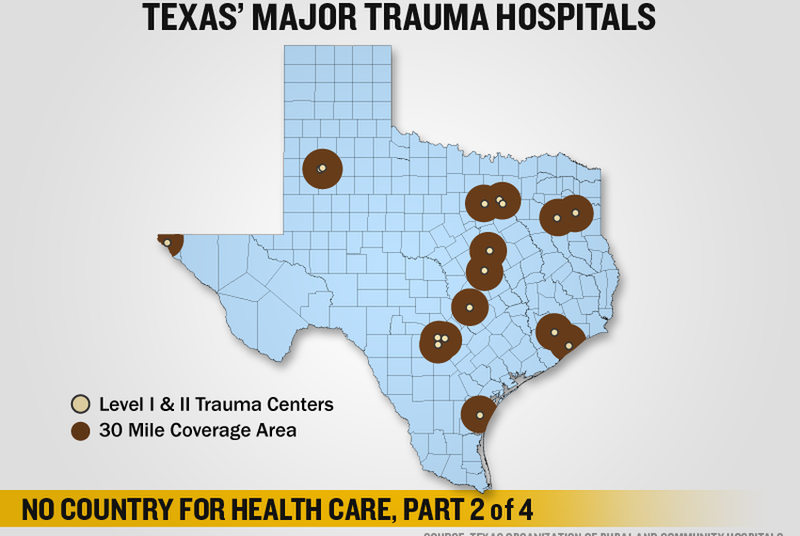 But many Texas counties aren’t anywhere near a level 1 or level 2 trauma center — those best suited to handle complex injuries or illness. Roughly half of the state is covered by the trauma centers in El Paso and Lubbock. In remote counties in West Texas, South Texas and the Panhandle, residents are often more than an hour from any trauma care at all. The golden hour is wasted. These isolated areas come with their own brand of injuries: hunting and ranch accidents, four-wheeler crashes. Most common are the car wrecks: late-night rollovers on highways with 80 mph speed limits. While just a third of the country’s motor vehicle accidents occur in rural areas, two-thirds of deaths attributed to these accidents happen on rural roads. The waits can get a lot longer than that. In Junction, one paid EMS worker and two ambulances cover a 3,800-square-mile area. Presidio and Marfa each have one ambulance, and a second out of commission for repairs. Luecke, who runs the Fort Davis Family Practice, said he’s seen it take two and a half hours for EMS to arrive at the scene of an accident; in inclement weather, the time can creep up even higher. In much of rural Texas, the reality is that care may not come in time. National statistics show rural residents are nearly twice as likely to die from accidental injuries than their urban peers — and that anywhere from 57 to 90 percent of rural first responders are volunteers. State Rep. Joe Heflin, D-Crosbyton, said it took an ambulance an hour and 15 minutes to reach a man having a heart attack in his rural Panhandle district because there weren’t enough certified EMTs to make the call. The man survived the initial attack, but his heart was so damaged by the delay that he later died. It took a gunned-down border patrol agent 12 hours to get to an El Paso trauma center a few years ago, Agan said. First, bad weather grounded the emergency helicopter. Then, the ambulance transporting the agent broke down. In recent years, trauma care conditions have improved slightly, the result of advocates’ work to keep rural hospitals and ambulance services afloat. Today, Agan said, border patrol helicopters and some private ambulance services will fly trauma patients out of isolated areas. Pam Dalzell, a former army medic now working as a nurse practitioner at the Fort Davis Family Practice, said she recently helped stabilize a man who fell off of a cliff in a four-wheeler accident, breaking his neck, two arms and his pelvis. He was at the hospital in Midland within three hours — considered a speedy transfer. Don McBeath, director of advocacy for the Texas Organization of Rural and Community Hospitals, said the best thing lawmakers can do to improve trauma care in rural Texas is to keep small local hospitals afloat, so they can triage trauma patients and transport them to major trauma centers. “The type of services they can provide may be limited, but at least they can stabilize the patient and get them where they need to be,” McBeath said.